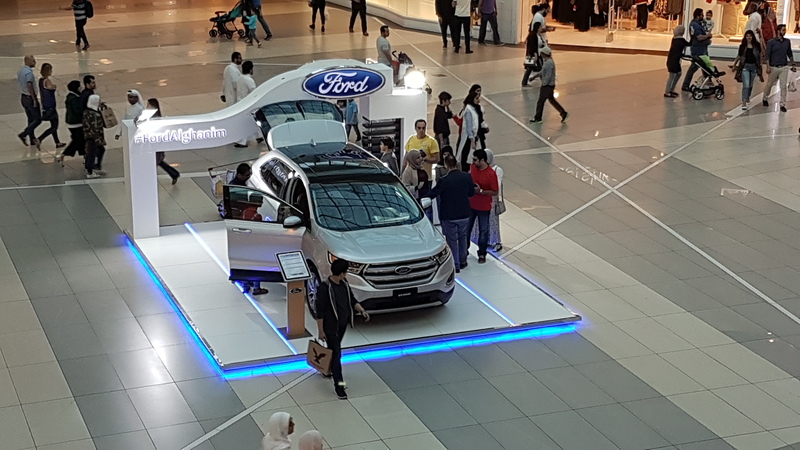 November 5, Kuwait – The All-New Ford Edge was displayed at the Avenues mall over the past weekend following its official introduction in Kuwait by Ford Middle East and Alghanim Auto last month. Available now at the new Alghanim Auto Ford showroom in Shuwaikh across from SIRBB Circuit, the All-New Ford Edge demonstrates what happens when a proven leader gets even better. In its 3rd generation, the new model features an impressive lineup of powertrains, class-leading technologies, higher levels of craftsmanship and greatly improved vehicle dynamics, guaranteed to impress drivers at first sight and during a test drive. The All-New Edge gathered warm attention while featured in Dome 2 at the 2nd Avenue from November 3-5, where mall goers and interested customers enjoyed an informative overview of the new crossover by Alghanim Auto’s professional sales consultants and trained promoters, who also offered customers the opportunity to book their test-drive appointments on the spot. The All-New Edge is available in four trim levels. These include SE, SEL, Sport and – for the first time – a top-of-the-line Titanium series to meet market demand for more premium offerings. In terms of powertrains, there are three engine options, two of which are new power plants – a standard twin-scroll 2.0-liter EcoBoost® four-cylinder with 253 PS and 378 Nm of torque, and the advanced 2.7-liter EcoBoost V6 on Sport models, delivering 340 PS and 542 Nm of torque. A normally aspirated 3.5-liter V6 engine is also available. All are equipped with a dual exhaust and a SelectShift® six-speed automatic transmission with paddle shifters and an available full-time all-wheel-drive system. Thanks in part to smart design work and next-generation seats that are thinner and more supportive, the interior of the new Edge is larger and more spacious. Adding further to the feeling of openness, Edge will continue to offer one of the largest sunroofs in the business – Ford’s Panoramic Vista Roof, measuring 121cm front to back. Legroom in the first and second row of the new Edge has increased by 4.8cm and 2.54cm, respectively. Headroom increases by 2.54cm throughout. Cargo capacity increases, with 39.2 cubic feet of space behind the second row of seats – 7.0 cubic feet more than the previous model. With the second row folded, space has increased by 4.5 cubic feet, to 73.4 cubic feet. For more information or to book a test drive, customers interested in the All-New Edge can visit the Alghanim Auto New Vehicle Showroom in Shuwaikh Industrial Area, opposite from the Classical Car Museum and Sirbb Circuit. The showroom is open from 9 am to 8 pm every day except Fridays. For more information, customers can call the customer care center at 1898900; visit www.fordalghanim.com or directly on social media channels at the handle @FordAlghanim.